First off, let me say that I have nothing bad to say about Warrior Dashes. That race in Logan, OH ignited my fire for obstacle racing and for that, I’m grateful. It’s a very fun, well-organized event and I’ll probably run in another one some day. Having said that, however, I am a Spartan Racer in heart and soul. Sure, I started at the top of their race chart with the Beast, but I plan on going to as many different events as I can possibly find the time and $$$$ for. Now, as for Tennessee, I don’t really have any love for that state, so the KY vs TN reference still stands! Actually, there are things I like about Tennessee, but it’s more fun this way. I had talked my wife into trying an obstacle race with me and she agreed to this Warrior Dash event. You can read about her experience in my previous post. We made the 4 hour drive down, arriving a couple of hours before our 2:30 heat. We checked in and I gave her a quick tour of the finish line where she could peak at the fire and mud pit. She was slightly taken aback by some of the costumes there, but that’s the appeal of this event for many (not me, though). We watched a heat take off and then took our own little warm-up run through an open field. I could already fill the adrenaline pumping. Per doctor’s orders, I was not permitted to run or do any plyometrics for 3 weeks due to a slight stress fracture in my left foot. This was an attempt to let it heal. I was a little concerned how I would respond, but I was there to go all out, hence my giddiness to start. As soon as the 2:00 heat left, we made our way down the narrow “chute” near the front of the starting line. Standing there for nearly 30 minutes made me even more restless. I had eyeballed the people around me to see if I could determine the competition. During my first two obstacle races, I’ll admit that I was intimated by the other runners. During my very first obstacle race in June I had no idea what to expect and I saw all these people who actually looked like “runners” and assumed they would crush me. That didn’t happen at all and my finishing time was way better than I expected. I think I finished in the upper 3% of all 10,000 racers that day. Then it was on to the Beast, where the race environment was littered with athletes galore. Once again, I was intimated and just hoped to finish in the upper half. Again, I suprised myself and finished in the upper percentile. So, with that experience under my belt, I’ll admit that I had a little swagger coming into this event! After training hard and conquering the Spartan Beast, this was going to be an easy race. I also knew better than to overestimate my competition. I started picking out the people in front of me in line that I was going to quickly overtake. Right before the race started, two young bucks (that’s what us old people call teenager/early twenties guys) pushed there way to the front of the line and were talking smack with each other. More about them later. The time finally ticked down, I told me wife “Let’s go compete!” and I zoned in. The fire blasts signalled the start and I quickly jumped and side-stepped my way to get some running room. I was so hyped that my legs felt like jelly for at least the first 3/4 of a mile. I just had to tell myself that it would go away, so just keep running. Before the first quarter mile, I had caught the aforementioned young bucks who had already exhausted themselves. I didn’t see them anymore the rest of the race. After the first half mile, I was the third runner out in my heat (keep in mind, however that I started near the front). There was one guy about my age and a little stocky who was leading and I was amazed at how fast he was going. About the time I thought that, he started slowing and the deceleration continued quickly. One guy overtook him and I followed suit….victim #3 of bad pacing. I did not look back the entire race, but I could sense that the pack was separating. From there on, there were 5 or 6 guys that passed me at various points. I think I re-passed all but one of them at some point too. I must just be a bad runner because they would pass me when there were long stretches of running and be 20 feet ahead of me as we approached obstacles. By the time we cleared the obstacles, I would be out in front again……only to fall behind when they outran me. Most of the obstacles in this race were walls and cargo nets. After climbing those monstrous walls at the Beast (with cramping calves), clearing the short walls and the walls with ropes here was child’s play. On one of the horizontal cargo net crawls, I got clock-blocked by 2 clearly novice women racers who were struggling to move across it. They were almost to the end as I came up to the obstacle, so I chose to go behind them thinking they would be clear. Wrong! The good thing is that they were nice and as I scrambled around (and partially overtop of one of them), one girl said pleasantly, but with a tinge of frustration, “go on around us Mr. Super Athlete”. I thanked them and smiled a little inside because super athlete I am not. Shortly after that obstacle I was clock-blocked again. See, I’m doing my part to help you with establishing that term, Carrie! This time it was a group of people in pink shirts who were walking side-by-side like they were in some Independence Day Parade for slow people. I’m not sure, but it seemed like they might have even been holding hands! Anyways, I darted and side-stepped through them while yelling “excuse me” a couple of times. I had hoped for some hills to help separate the “straight” runners from the obstacle racers, but there wasn’t the slightest bit of incline on that course. I was reminded again at certain points that I don’t like to run just to be running. On one really long stretch, it even entered my mind to slow down a little and catch my breath. I then remembered that I was a Spartan Racer and quickly vanquished that thought to the netherlands! One kinda funny thing that happened during a run through the woods is that I somehow tripped over a tree root and went crashing to the ground with an “oooomph” exhaling from my body. Fortunately I didn’t injure myself and was quickly back on my feet. That gave the guy behind me the time to pass me again….that was until the next wall when I passed him for like the 4th or 5th time! Finally, as I rounded the corner toward the end I had that last shot of adrenaline and had 2 pretty high jumps over the fire and then a long jump into the mud pit. I didn’t care about style or how dirty or clean I stayed…just wanted to finish quickly. When I came out of the mud, some big behemoth of a guy was slogging along (another clock blocker!) causing me to have to check up (and fall again in the mud). I was quickly back up and with legs and feet flailing every which direction I hurried to the finish line. No style points for the finish. Got my water and banana and waited for my wife. It really wasn’t that long until she finished and I was thrilled to hear how she had done. I won’t bore you with all the details of trying to get rinsed off. It was definitely a long and convoluted story. In the meantime I waited around at one of the monitors to see our times. I couldn’t believe it when I saw that I was currently 3rd in my age group (the old men’s age group, as my wife refers to it). That was great, but it also meant that I had to stick around until I was knocked out of third or until the race was over to receive an award. I’m tired of typing, so I’m going to cut to the chase. We went to the awards ceremony and waited for my age group. At this point, I did not know if I was still in 3rd or not because the standings hadn’t rotated back around for 30 minutes or so. I was going to be really ticked if we waited an extra 2 hours only to be knocked out of the standings. 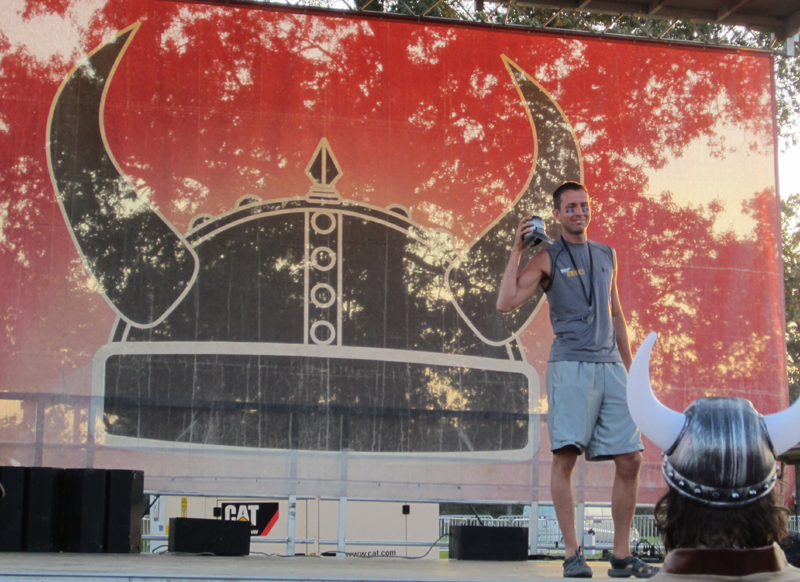 Fortunately my name was called and this Spartan Racer received his warrior helmet trophy. Final time of 30:11, finishing 3 out of 609 in my age group. I knew I had done pretty well, especially given my angst over injury, but I had no idea that I would do this good. That just made the long ride home that much better. I cannot wait until the Spartan Sprint in 4 weeks, but let me state now that I do not have the unreal expectations of finishing as high in that race. Warrior Dashes are great, but the Spartans are a completely different level. Let the training begin. Aroo! Aroo! Aroo! Previous Spartan Chick about to hatch! What exactly do you not understand about “Per doctor’s orders, I was not permitted to run or do any plyometrics for 3 weeks due to a slight stress fracture in my left foot”?